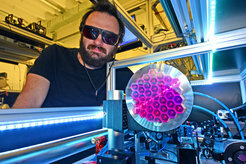 Physicists at LMU Munich and the Max Planck Institute of Quantum Optics have validated a novel laser-driven means of generating bright and highly energetic X-ray beams. The method opens up new ways of imaging the fine structure of matter. For over a century, medical imaging has made use of X-rays produced in a specialized type of vacuum tube. The major disadvantage of this method lies in the poor quality of the emitted radiation. The source emits radiation from a large spot into all directions and over a broad energy range. These features are responsible for the relatively modest resolution attainable with this mode of imaging. X-rays generated in synchrotrons provide much higher resolution, but their dimensions and cost preclude their routine use in clinical settings. However, an alternative approach is now available, for two laser pulses can generate X-rays of similar quality to synchrotron radiation in devices with a far smaller footprint: One pulse accelerates electrons to very high energy and the other forces them into an undulating motion. Under these conditions, electrons emit X-radiation that is both highly energetic (‚hard‘) and highly intense, and is therefore ideal for probing the microscopic structure of matter. Now, physicists based at the Laboratory for Attosecond Physics (LAP) at LMU Munich and the Max Planck Institute of Quantum Optics (MPQ) have developed such a laser-driven X-ray source for the first time. With the aid of two laser pulses, the researchers have generated ultrashort bursts of X-rays with defined wavelengths tailored for different applications. The new source can image structures of varying composition with a resolution of less than 10 micrometers. This breakthrough opens up a range of promising perspectives in materials science, biology and – in particular – medicine. The physicists focused a laser pulse, lasting 25 femtoseconds and packing 60 terawatts (6×10^13 Watts) of power, onto a fine jet of hydrogen gas. Note here that the output of a nuclear power station – 1500 MW (1.5×109 Watts) – is very modest by comparison, but each pulse only lasts for 25 millionths of a billionth of a second. The strong electric field associated with each pulse knocks negatively charged electrons out of the gas, giving rise to a cloud of ionized particles, or ‘plasma’. The wavefront courses through the plasma like a snow-plow, sweeping the electrons aside and leaving behind the positively charged atoms (which are much heavier). The separation of oppositely charged particles generates very strong electrical fields, which cause the displaced electrons to whiplash back and forth. This in turn creates a wave-like pattern within the plasma, which propagates in the wake of the laser pulse, rather like the trailing wave caused by the keel of a speedboat racing on a lake. A fraction of the free electrons are caught up in this wave and can effectively ride on it like a surfer, directly behind the advancing laser pulse. Indeed, in this ‘wakefield’, the surfing electrons can be rapidly accelerated to velocities very near the speed of light. When the electrons have reached their maximal speed they are allowed to collide head-on with a counter-propagating laser pulse, creating a so-called optical undulator whose oscillating electric field causes the free electrons to oscillate along a direction perpendicular to their direction of propagation. Highly energetic electrons that are forced to oscillate in this way emit radiation in the form of X-ray photons with wavelengths as short as 0.03 nm. In addition, in these experiments, the higher harmonics (waves whose frequency is an integer multiple of the fundamental frequency) entrained on the electron motions by the light field could be detected directly in the X-ray spectrum – a feat that has been attempted many times on conventional particle accelerators without success. The new optically generated radiation can also be combined with phase-contrast X-ray tomography, an imaging procedure that is being refined by Prof. Franz Pfeiffer of the Technical University of Munich (TUM). This technique extracts information from the light that is scattered (rather than that absorbed) by an object. “Using this method, we can already image structures as small as 10 micrometers in diameter in opaque materials,” Stefan Karsch explains. “With our new X-ray source, we will be able to obtain even more detailed information from living tissues and other materials,” he adds.